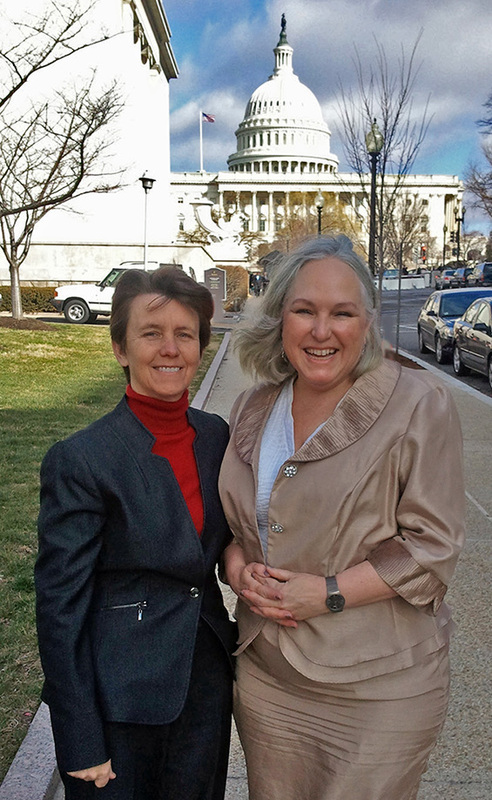 Margaret Mooney, Director of CIMSS Education and Outreach, climbed Capitol Hill on 26-27 February 2013 to participate in Climate Science Day in Washington, D.C.
An effort of the non-partisan Climate Science Working Group (CSWG), the intensive two-day event involved 50 scientists recruited from a dozen different professional societies and research organizations to meet with members of Congress and their staffs. Limiting the Federal Government’s Fiscal Exposure by Better Managing Climate Change Risks. Margaret Mooney and Dr. Betsy Weatherhead from CIRES. 9:15 – 9:45 a.m. Chris King (Staff Director for Minority/Dems); House Science Committee, Subcommittee on Environment. 10:00 – 10:30 a.m. David Wegner (Professional Staff for Minority/Dems); House Committee on Transportation and Infrastructure, Subcommittee on Water Resources and Environment. 3:15 – 3:45 p.m.; Rep. Steve Daines (R-MT-ALL); Patrick Buell (Legislative Assistant). 4:00 – 4:30 p.m.; Sen. Mark Kirk (R-IL); Sarah Walter (Science Legislative Assistant). The 2013 Climate Science Day event harkens back to 1988 when James Hansen became the first climate scientist to testify in front of the entire US Congress. This year 50 scientists from around the country took a more targeted approach by meeting one-on-one with political aides to highlight research, impacts and responses to climate change in or near specific congressional districts. For example, when speaking to representatives from Wisconsin, Illinois, and Minnesota, Mooney started with the climate research legacy of Verner Suomi (UW-Madison’s founder of SSEC and CIMSS) and pointed to recent findings from the Wisconsin Initiative for Climate Change Impacts (WICCI) and Midwest examples from the National Climate Assessment. As predicted by science, the Earth’s changing climate and extremes of weather are disrupting ecosystems, infrastructure, and society. The organizers and participants of Climate Science Day hope their efforts will connect policy and decision makers responding to climate disruption with sound science moving forward.